As a long time fan of James Patterson's Alex Cross novels, I thought Morgan Freeman was the perfect choice to play Cross, and I loved Kiss The Girls. I was weary of a remake, especially one done by Tyler Perry, but to my surprise he was much better than expected, unfortunately, the film was not. Alex Cross has always been about beating criminals with his mind. The forensic psychologist is best known for his ability to out think rather than over power his opponents, but you'd never know it by watching this film. Alex Cross and his team are called in on a triple homicide, but the suspect had more on his mind then just his targets, and sets his sights on Cross and the team. There is a heavy focus right from the beginning on the bad guy, who we immediately see is Matthew Fox. To me this took all the mystery right out of the story, and instead of being a who done it, the film was about how to catch the bad guy. The writers didn't do that right either, as Alex Cross is blinded by rage and goes out guns blazing to fight and kill the assailant. While this may make for an exciting action film, it's not who or what Alex Cross is all about, and despite all the novels I've read, I felt like I didn't know the characters at all. Tyler Perry stars as Cross and shows that he's more than just a comedian dressed as an old woman. Perry was very intense and likeable, under different circumstances I would have really enjoyed his performance, but again, he wasn't playing the Alex Cross I know. He's paired with Lost's Matthew Fox, who has played the bad guy before. I love Fox as an actor, but he just doesn't have the look or temperament of a killer and wasn't very believable here. 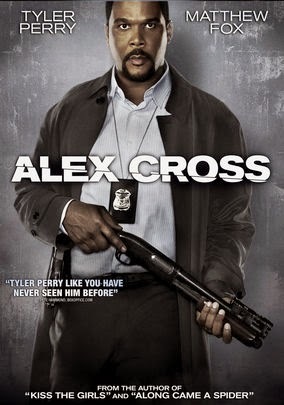 Alex Cross is one of my all time favorite characters, and the first time they put him on film, they did it right. The second time, wasn't one of Patterson's better stories, but still very well done. This time, Alex Cross has turned into John McLean, and while some people will love it, to me it just emphasized everything that is wrong with Hollywood today.